Kitchen countertops are made with durability in mind, but even the strongest countertops encounter problems now and again. In order to get the most out of your countertops they must be properly installed and regularly maintained—and even then, issues can still arise. 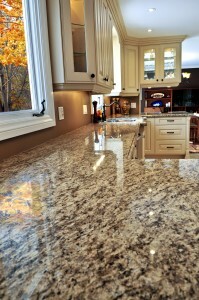 You rely on your kitchen countertops for so much, including the overall appearance of your kitchen. There’s a better solution than trying to hide a problem with an oversized fruit bowl. Here we explain 7 of the most common countertop problems, plus provide answers how to help fix them. A ruptured countertop can look bad, but it usually impacts a small portion of your countertop. Many people fear they will have to replace the entire counter in order to fix the damage, but in many cases the isolated damage can be fixed separately from the entire slab. The type of rupture damage your counters encounter will influence the method used to fix the problem. For smaller rupture cracks, manufacturer advised adhesive is often used to repair damage. For deeper cracks or damaged caused by excessive weight, the damaged portion will need to be removed using a drill before applying special filler. 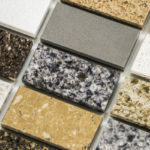 It’s very important to find a filler material that blends together seamlessly with your countertops, this is the tricky part that a professional can really help you out with. For appliances that rely on countertops to hold them up, extra support is necessary in order to stabilize everything. If your countertops are not installed with sufficient reinforcements, the weight of heavy appliances or features can cause an eventual breakdown of materials. Sufficient support is key for countertops expected to support appliances, cabinets or any type of weight. For appliances that exert heat, you need specially placed vents in order to prevent counters, cabinets, and other kitchen features from cracking due to heat damage. Water can damage just about anything, including countertops. Smaller kitchens have the greatest risk for water damage, as well as kitchens that include laminate or wood countertops. 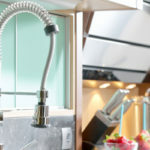 If you notice the door to your dishwasher isn’t closing right these days, or parts of your counters are suddenly uneven with cabinets, these can all be signs of water damage. To prevent water damage from happening in your kitchen, a vapor barrier of some sort should be applied during installation. You also want to pay close attention to your sink, without proper sealants it can leak water into cabinets or counters. Check under the sink, inspecting all drainage pipes for current drips, and making sure joints are sealed with silicone. If you find a leak, it needs to be filled with a caulking seal. Properly installed and maintained dishwashers and sinks are less likely to create water damage, but there is always the possibility for one. If you have suspicions about water damage you want to react quickly. The surface of your countertops should determine the type of cleaner you use. If you use harsh cleaners on marble counters the devastating effects appear rather quickly. Granite, on the other hand, tends to appear fine at first and then diminish in quality and shine over time due to chronic exposure to harsh cleaning products. 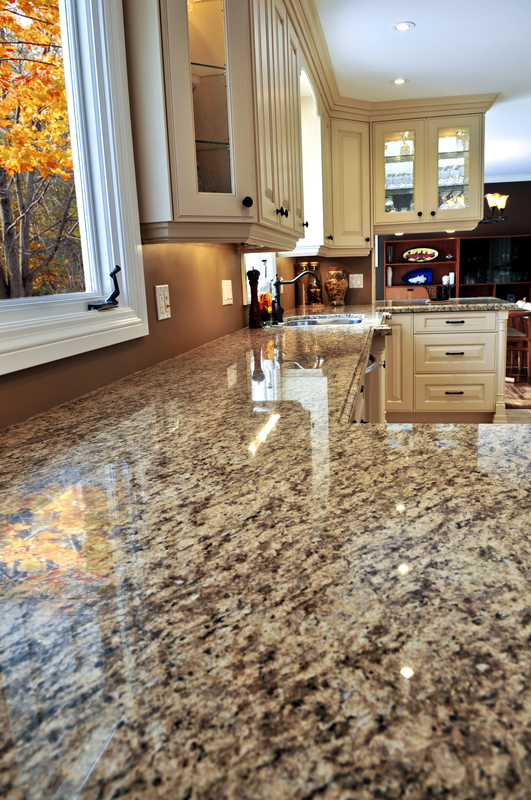 Once your granite has lost its shine there are available solutions that don’t require removing and replacing your countertops. Instead, a professional from a local granite store can buff and re-polish countertops so that they look like new. This is not a project you should try on your own, or else you risk making the problem worse. Most cleaners are too harsh for marble and granite surfaces. For everyday cleaning, opt for soap and warm water. You should always read the ingredients and look for cleaners designed with your surface in mind. While it might cost more to buy cleaners made specifically for granite or marble, they are worth it because they help preserve the life and shine of your countertops. Kitchen countertops are made to withstand a good deal of heat and force, but they can damage. When you are cooking there are all sorts of hot things going on in your kitchen, and sometimes an overly hot pan ends up bare-bottom on your countertops. In some cases, the damage is non-existent, in which case you are lucky. But other times, hot pans can leave a mark behind—an eyesore that reminds you constantly of that one silly mistake. Despite being strong as a rock, all types of stone countertops will crack or discolor under too high of heat. Using potholders, trivets, and other barriers will help keep the heat directly off your countertops so that you don’t have to worry about this problem. But, what do you do after the damage already occur? Depending on the surface material of your countertops, the solution to remove the stain will vary. For all types of counters the first step is to thoroughly clean the area so that no dirt or debris are left behind. Apply a layer of toothpaste to the freshly cleaned surface using a rubber spatula. Allow the toothpaste to sit for 10 minutes or so. Use a toothbrush, or other soft-bristled brush, to scrub at the stain. Once you notice the stain has disappeared, wipe surfaces clean again with a freshly moist towel. Other countertop surfaces can be fixed using slightly different, but similar methods. For instance, heat stains on stainless steel countertops can be fixed with club soda instead of toothpaste. And if you are trying to remove stains from a porcelain countertop, you can use a mixture of baking soda and water. The same white crusty buildup often found around kitchen sink faucets can also occur on your counters. When water, especially mineral-rich hard water, has a chance to sit on countertops it can create a circular stain. Use a soft bristled brush and gentle cleaner to scrub at stubborn water stains. If nothing seems to work, you can always try a poultice or extractor made especially for granite. The thick paste mixture can be purchased at your local hardware store. You will apply it over your counters, and then completely cover with a plastic sheet, secured around the edges with tape. After 24 hours, remove the plastic and paste before rinsing countertops thoroughly. To prevent future water stains from occurring, it’s important to regularly clean countertops and make sure water never has a chance to sit. Since pans, knives, and other utensils are routinely pushed around and used on counters, chips and scratches become a likely occurrence. Scratches are one of the most common problems countertops develop. For laminate surfaces you can use a specially made repair pen or paste in order to fill in the scratches, or cuts. You want to fill in the blemish exactly, don’t underfill or overfill because once the filler dries you can’t remove it. Apply masking tape over the surrounding counter space, so that only the damaged area is left uncovered. Mix an epoxy resin with the appropriate color pigments so that it matches your granite color exactly, or at least darn near close. Once you have the formula properly mixed, you use a stick to apply the epoxy mix to the chip or scratch, building up the mixture slightly higher than the surrounding counters. Use a razor blade to scrape off the excess filler for a smooth finish. Place a piece of clear tape over the newly filled chipped surface, this forces the resin deeper into the chip that it provides a more concrete seal. Read the manufacture guidelines, and remove the tape as specified. You will need 3 types of sandpaper to level the area and blend it in. You will start blending with 200-grit, then 800-grit, followed by 2000-grit sandpaper. Not everyone has drills and buffers sitting around the house, nor is everyone comfortable mixing epoxy resins with color pigments in order to perfectly match countertops. 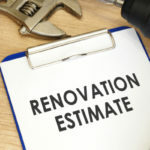 While in some cases little countertop problems can be fixed on your own, the process often requires a professional with the right tools, expertise, and eye for the job. 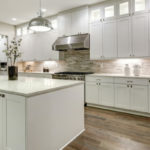 If your counters are laden with issues, it’s completely normal, after all even the most durable and well-laid countertops will need maintenance at some point. If your countertops are full of eyesores and issues, it might be time for new counters. We have you covered at Tops Kitchen Cabinet with our high quality selection of countertops at affordable, wholesale prices!